Simplicity Theory says that interesting situations must appear abnormally simple. This means that they are less complex (in the Kolmogorov sense) than expected. This led me to define subjective probability as p = 2–U, where U represents unexpectedness. Exposé pour le centenaire de Claude Shannon à l’Institut Henri Poincaré. Dessalles, J.-L. (2019). 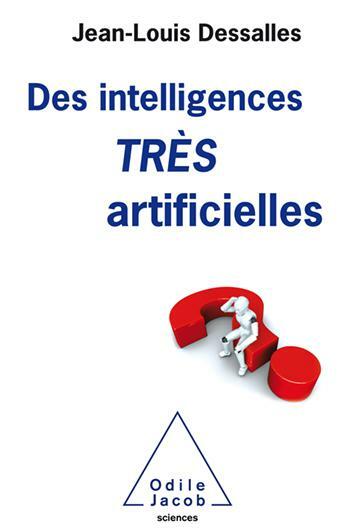 Des intelligences très artificielles. Odile Jacob. Si vous marchez à reculons, les traces de pas que vous voyez devant vous sont les vôtres. Aucun robot, aucune intelligence artificielle (IA) ne sait ce genre de choses, sauf si l'on a pensé à les lui dire. Les IA sont-elles si intelligentes que cela ? À bien y regarder, elles apparaissent très intelligentes et très stupides à la fois. Pour quelle raison ? En sera-t-il toujours ainsi ? 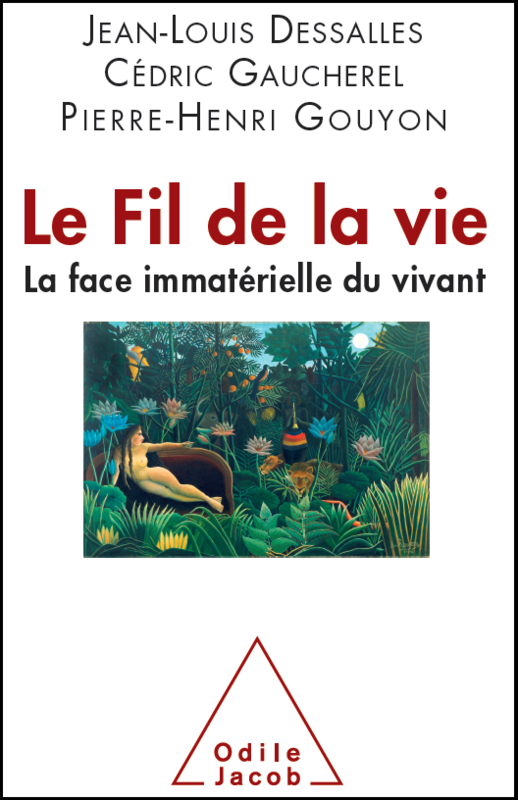 Dans ce livre, Jean-Louis Dessalles aborde ces questions d'une manière précise et accessible à tous. Chaque lecteur trouvera dans ce livre de quoi le surprendre. Il nous parle du passé, du présent et du futur des IA. Il évoque même ce qui, selon lui, leur manque pour devenir... intelligentes. Murena, P.-A., Cornuéjols, A. & Dessalles, J.-L. (2018). Opening the parallelogram: Considerations on non-Euclidean analogies. In M. T. Cox, P. Funk & S. Begum (Eds. ), Case-Based Reasoning Research and Development - ICCBR 2018, 597-611. Lecture Notes in Computer Science, vol 11156. Analogical reasoning is a cognitively fundamental way of reasoning by comparing two pairs of elements. Several computational approaches are proposed to efficiently solve analogies: among them, a large number of practical methods rely on either a parallelogram representation of the analogy or, equivalently, a model of proportional analogy. In this paper, we propose to broaden this view by extending the parallelogram representation to differential manifolds, hence spaces where the notion of vectors does not exist. We show that, in this context, some classical properties of analogies do not hold any longer. We illustrate our considerations with two examples: analogies on a sphere and analogies on probability distribution manifold. Sileno, G. & Dessalles, J.-L. (2018). Qualifying Causes as Pertinent. In T. T. Rogers, M. Rau, X. Zhu & C. W. Kalish (Eds. ), Proceedings of the 40th Annual Conference of the Cognitive Science Society, 2488-2493. Austin, TX: Cognitive Science Society. Several computational methods have been proposed to evaluate the relevance of an instantiated cause to an observed consequence. The paper reports on an experiment to investigate the adequacy of some of these methods as descriptors of human judgments about causal relevance. Sileno, G., Saillenfest, A. & Dessalles, J.-L. (2017). A computational model of moral and legal responsibility via simplicity theory. In A. Wyner & G. Casini (Eds. ), 30th international conference on Legal Knowledge and Information Systems (JURIX 2017), 171-176. Frontiers in Artificial Intelligence and Applications, 302. Responsibility, as referred to in everyday life, as explored in moral philosophy and debated in jurisprudence, is a multiform, ill-defined but inescapable notion for reasoning about actions. Its presence in all social constructs suggests the existence of an underlying cognitive base. Following this hypothesis, and building upon simplicity theory, the paper proposes a novel computational approach. Dessalles, J.-L. (2017). Conversational topic connectedness predicted by Simplicity Theory. In G. Gunzelmann, A. Howes, T. Tenbrink & E. Davelaar (Eds. ), Proceedings of the 39th Annual Conference of the Cognitive Science Society, 1914-1919. Austin, TX: Cognitive Science Society. People avoid changing subject abruptly during conversation. There are reasons to think that this constraint is more than a social convention and is deeply rooted in our cognition. We show here that the phenomenon of topic connectedness is an expected consequence of the maximization of unexpectedness and that it is predicted by Simplicity Theory. Murena, P.-A., Dessalles, J.-L. & Cornuéjols, A. (2017). A complexity based approach for solving Hofstadter's analogies. In A. Sanchez-Ruiz & A. Kofod-Petersen (Eds. ), Workshops of the International Conference on Case-Based Reasoning (ICCBR-WS 2017), 53-62. Trondheim, Norway: . Analogical reasoning is still a difficult task for machines. In this paper, we consider the problem of analogical reasoning and assume that the relevance of a solution can be measured by the complexity of the analogy. This hypothesis is tested in a basic alphanumeric micro-world. Murena, P.-A., Cornuéjols, A. & Dessalles, J.-L. (2017). Incremental learning with the minimum description length principle. International Joint Conference on Neural Networks (IJCNN 2017) Anchorage, Alaska: . Incremental learning designates online learning of a model from streaming data. In non-stationary environments, the process generating these data may change over time, hence the learned concept becomes invalid. Adaptation to this non-stationary nature, called concept drift, is an intensively studied topic and can be reached algorithmically by two opposite approaches: active or passive approaches. We propose a formal framework to deal with concept drift, both in active and passive ways. Our framework is derived from the Minimum Description Length principle and exploits the algorithmic theory of information to quantify the model adaptation. We show that this approach is consistent with state of the art techniques and has a valid probabilistic counterpart. Saillenfest, A., Dessalles, J.-L. & Auber, O. (2016). Role of simplicity in creative behaviour: The case of the poietic generator. In F. Pachet, A. Cardoso, V. Corruble & F. Ghedini (Eds. ), Proceedings of the Seventh International Conference on Computational Creativity (ICCC-2016), 33-40. Paris, France: Sony CSL. We propose to apply Simplicity Theory (ST) to model interest in creative situations. ST has been designed to describe and predict interest in communication. Here we use ST to derive a decision rule that we apply to a simplified version of a creative game, the Poietic Generator. The decision rule produces what can be regarded as an elementary form of creativity. This study is meant as a proof of principle. It suggests that some creative actions may be motivated by the search for unexpected simplicity. Dessalles, J.-L. (2015). L'imaginaire de la narration : une approche cognitive. In P. Musso, S. Coiffier & J.-F. Lucas (Eds. ), Pour innover, modéliser l'imaginaire - Regards croisés d'industriels et de chercheurs, 154-167. Paris: Editions Manucius. Quelles sont les propriétés dont doit jouir une histoire pour être une histoire ? Il est possible de répondre à cette question en se plaçant dans le cadre de la modélisation cognitive. La notion centrale développée ici est celle de simplicité cachée. Pour être intéressante, une situation imaginaire doit comporter une « révélation » qui simplifie une situation perçue comme complexe. Ce cadre conceptuel peut avoir des retombées qui débordent le domaine de la production narrative. Il concerne potentiellement toute création de l'esprit censée intéresser autrui. Ceci inclut les récits, mais aussi les objets ou les projets, dès lors que ces objets ou ces projets se voient dotés d'une valeur narrative. Saillenfest, A. & Dessalles, J.-L. (2015). Some probability judgements may rely on complexity assessments. Proceedings of the 37th Annual Conference of the Cognitive Science Society, 2069-2074. Austin, TX: Cognitive Science Society. Human beings do assess probabilities. Their judgments are however sometimes at odds with probability theory. One possibility is that human cognition is imperfect or flawed in the probability domain, showing biases and errors. Another possibility, that we explore here, is that human probability judgments do not rely on a weak version of probability calculus, but rather on complexity computations. This hypothesis is worth exploring, not only because it predicts some of the probability ‘biases’, but also because it explains human judgments of uncertainty in cases where probability calculus cannot be applied. We designed such a case in which the use of complexity when judging uncertainty is almost transparent. Saillenfest, A. & Dessalles, J.-L. (2014). Can Believable Characters Act Unexpectedly? Literary & Linguistic Computing, 29 (4), 606-620. Unexpectedness is a major factor controlling interest in narratives. Emotions, for instance, are felt intensely if they are associated with unexpected events. The problem with generating unexpected situations is that either characters, or the whole story, are at risk of being no longer believable. This issue is one of the main problems that make story design a hard task. Writers face it on a case by case basis. The automatic generation of interesting stories requires formal criteria to decide to what extent a given situation is unexpected and to what extent actions are kept believable. This paper proposes such formal criteria and makes suggestions concerning their use in story generation systems. Dessalles, J.-L. (2013). Algorithmic simplicity and relevance. In D. L. Dowe (Ed. ), Algorithmic probability and friends - LNAI 7070, 119-130. Berlin, D: Springer Verlag. The human mind is known to be sensitive to complexity. For instance, the visual system reconstructs hidden parts of objects following a principle of maximum simplicity. We suggest here that higher cognitive processes, such as the selection of relevant situations, are sensitive to variations of complexity. Situations are relevant to human beings when they appear simpler to describe than to generate. This definition offers a predictive (i.e. refutable) model for the selection of situations worth reporting (interestingness) and for what individuals consider an appropriate move in conversation. Saillenfest, A. & Dessalles, J.-L. (2013). Using unexpected simplicity to control moral judgments and interest in narratives. In M. A. Finlayson, B. Fisseni, B. Löwe & J. C. Meister (Eds. ), 2013 Workshop on Computational Models of Narrative - OASIcs vol. 32, 214-227. Saarbrücken, Germany: . Saillenfest, A. & Dessalles, J.-L. (2012). Role of kolmogorov complexity on interest in moral dilemma stories. In N. Miyake, D. Peebles & R. Cooper (Eds. ), Proceedings of the 34th Annual Conference of the Cognitive Science Society, 947-952. Austin, TX: Cognitive Science Society. Several studies have highlighted the combined role of emotions and reasoning in the determination of judgments about morality. Here we explore the influence of Kolmogorov complexity in the determination, not only of moral judgment, but also of the associated narrative interest. We designed an experiment to test the predictions of our complexity-based model when applied to moral dilemmas. It confirms that judgments about interest and morality may be explained in part by discrepancies in complexity. This preliminary study suggests that cognitive computations are involved in decision-making about emotional outcomes. Dessalles, J.-L. (2011). Simplicity Effects in the Experience of Near-Miss. In L. Carlson, C. Hoelscher & T. F. Shipley (Eds. ), Proceedings of the 33rd Annual Conference of the Cognitive Science Society, 408-413. Austin, TX: Cognitive Science Society. Near-miss experiences are one of the main sources of intense emotions. Despite people's consistency when judging near-miss situations and when communicating about them, there is no integrated theoretical account of the phenomenon. In particular, individuals' reaction to near-miss situations is not correctly predicted by rationality-based or probability-based optimization. The present study suggests that emotional intensity in the case of near-miss is in part predicted by Simplicity Theory. Dessalles, J.-L. (2011). Ex-Post Algorithmic Probability. Technical Report Telecom-ParisTech 2011-D-009. Algorithmic probability is traditionally defined by considering the output of a universal machine fed with random programs. This definition proves inappropriate for many practical applications where probabilistic assessments are spontaneously and instantaneously performed. In particular, it does not tell what aspects of a situation are relevant when considering its probability ex-post (after its occurrence). As it stands, the standard definition also fails to capture the fact that simple, rather than complex outcomes are often considered improbable, as when a supposedly random device produces a repeated pattern. More generally, the standard algorithmic definition of probability conflicts with the idea that entropy maximum corresponds to states that are both complex (unordered) and probable. We suggest here that algorithmic probability should rather be defined as a difference in complexity. We distinguish description complexity from generation complexity. Improbable situations are situations that are more complex to generate than to describe. We show that this definition is more congruent with the intuitive notion of probability. Dessalles, J.-L. (2010). Have you anything unexpected to say? The human propensity to communicate surprise and its role in the emergence of language. In A. D. M. Smith, M. Schouwstra, B. de Boer & K. Smith (Eds. ), The evolution of language - Proceedings of the 8th International Conference (Evolang8 - Utrecht), 99-106. Singapore: World Scientific. Individuals devote one third of their language time to mentioning unexpected events. We try to make sense of this universal behaviour within the Costly Signalling framework. By systematically using language to point to the unexpected, individuals send a signal that advertises their ability to anticipate danger. This shift in display behaviour, as compared with typical displays in primate species, may result from the use by hominins of artefacts to kill. Dessalles, J.-L. (2010). Emotion in good luck and bad luck: predictions from Simplicity Theory. In S. Ohlsson & R. Catrambone (Eds. ), Proceedings of the 32nd Annual Conference of the Cognitive Science Society, 1928-1933. Austin, TX: Cognitive Science Society. The feeling of good or bad luck occurs whenever there is an emotion contrast between an event and an easily accessible counterfactual alternative. This study suggests that cognitive simplicity plays a key role in the human ability to experience good and bad luck after the occurrence of an event. Dimulescu, A. & Dessalles, J.-L. (2009). Understanding narrative interest: Some evidence on the role of unexpectedness. In N. A. Taatgen & H. van Rijn (Eds. ), Proceedings of the 31st Annual Conference of the Cognitive Science Society, 1734-1739. Amsterdam, NL: Cognitive Science Society. This study is an attempt to measure the variations of interest aroused by conversational narratives when definite dimensions of the reported events are manipulated. The results are compared with the predictions of the Complexity Drop Theory, which states that events are more interesting when they appear simpler, in the Kolmogorov sense, than anticipated. Dessalles, J.-L. (2009). Destin ou coïncidences ? Cerveau & Psycho, 35, 18-21. Deux présidents emblématiques des États-Unis ont été assassinés à 1OO ans d'intervalle et leur histoire présente plusieurs points communs. Pourquoi notre cerveau est-il irrésistiblement attiré par de telles coïncidences, y cherchant des marques du destin ? Dimulescu, A. & Dessalles, J.-L. (2009). Prédire l'intérêt dans la communication événementielle. In N. Maudet, P.-Y. Schobbens & M. Guyomard (Eds. ), Modèles formels de l'interaction (MFI-09) - Actes des cinquièmes journées francophones, 125-134. Lannion: . Cette étude vise à mesurer les variations de l'intérêt suscitées par un événement lorsque certaines dimensions définies sont manipulées. Les résultats sont comparés aux prédictions de la théorie du décalage de complexité, selon laquelle les événements sont d'autant plus intéressants qu'ils sont plus simples qu'attendu. Dessalles, J.-L. (2008). Coincidences and the encounter problem: A formal account. In B. C. Love, K. McRae & V. M. Sloutsky (Eds. ), Proceedings of the 30th Annual Conference of the Cognitive Science Society, 2134-2139. Austin, TX: Cognitive Science Society. Individuals have an intuitive perception of what makes a good coincidence. Though the sensitivity to coincidences has often been presented as resulting from an erroneous assessment of probability, it appears to be a genuine competence, based on non-trivial computations. The model presented here suggests that coincidences occur when subjects perceive complexity drops. Co-occurring events are, together, simpler than if considered separately. This model leads to a possible redefinition of subjective probability. Dessalles, J.-L. (2008). 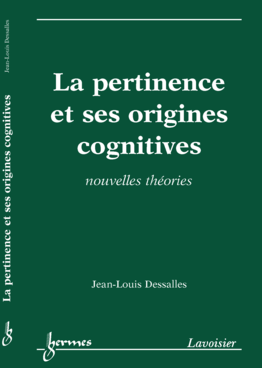 La pertinence et ses origines cognitives - Nouvelles théories. Paris: Hermes Science. Les conversations quotidiennes constituent une arène permanente où se joue l'essentiel de notre existence sociale. Dans ce jeu proprement humain, la pertinence est le principal critère. Nous possédons tous une intuition précise de ce qui rend une histoire ou un argument pertinent et nous sommes hypersensibles aux défauts de pertinence. Dessalles, J.-L. (2007). Spontaneous assessment of complexity in the selection of events. Technical Report ParisTech-ENST 2007D011. Dessalles, J.-L. (2007). 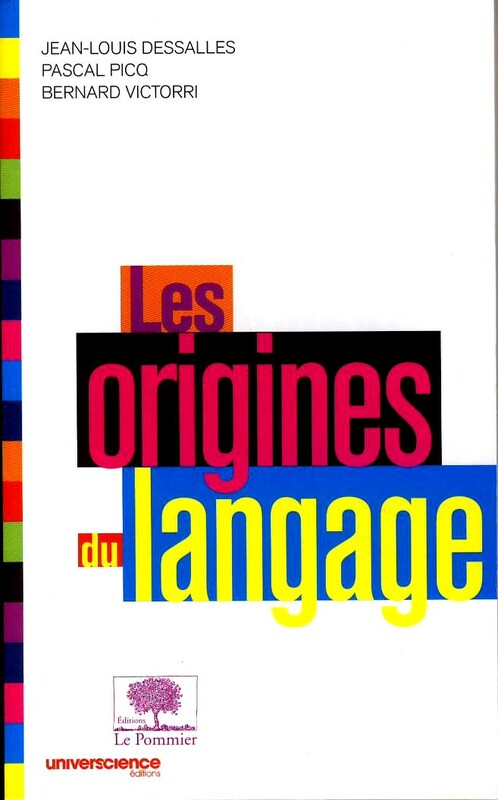 Complexité cognitive appliquée à la modélisation de l'intérêt narratif. Intellectica, 45 (1), 145-165. Nous définissons la complexité cognitive comme une notion dérivée de la complexité de Kolmogorov. Nous montrons qu'une partie importante de ce qui retient l'intérêt des êtres humains, notamment lors de la sélection des événements spontanément signalés ou rapportés, peut être prédite par un saut de complexité cognitive. Nous évaluons les conséquences de ce modèle pour l'étude de la pertinence conversationnelle. Dessalles, J.-L. (2006). Intérêt conversationnel et complexité : le rôle de l'inattendu dans la communication spontanée. Psychologie de l'Interaction, , 259-281. La conversation humaine agit comme un filtre extraordinairement sélectif : seule une infime partie des situations que les locuteurs ont vécues ou ont pu connaître sera jugée digne d'être rapportée aux interlocuteurs. L'un des objectifs de la recherche sur le langage consiste à rechercher des critères permettant de prévoir si une situation sera perçue comme suffisamment « intéressante » si elle est mentionnée en conversation. Nous montrons ici que le caractère inattendu de certaines situations, qui conduit souvent à ce qu'elles soient rapportées en conversation, est lié à des écarts de complexité, et que ce phénomène peut s'expliquer dans le cadre plus général de la théorie « shannonienne » de la communication événementielle. Dessalles, J.-L. (2006). A structural model of intuitive probability. In D. Fum, F. Del Missier & A. Stocco (Eds. ), Proceedings of the seventh International Conference on Cognitive Modeling, 86-91. Trieste, IT: Edizioni Goliardiche. Though the ability of human beings to deal with probabilities has been put into question, the assessment of rarity is a crucial competence underlying much of human decision-making and is pervasive in spontaneous narrative behaviour. This paper proposes a new model of rarity and randomness assessment, designed to be cognitively plausible. Intuitive randomness is defined as a function of structural complexity. It is thus possible to assign probability to events without being obliged to consider the set of alternatives. The model is tested on Lottery sequences and compared with subjects' preferences. Bonabeau, E. & Dessalles, J.-L. (1997). Detection and emergence. Intellectica, 25 (2), 85-94. Two different conceptions of emergence are reconciled as two instances of the phenomenon of detection. In the process of comparing these two conceptions, we find that the notions of complexity and detection allow us to form a unified definition of emergence that clearly delineates the role of the observer.